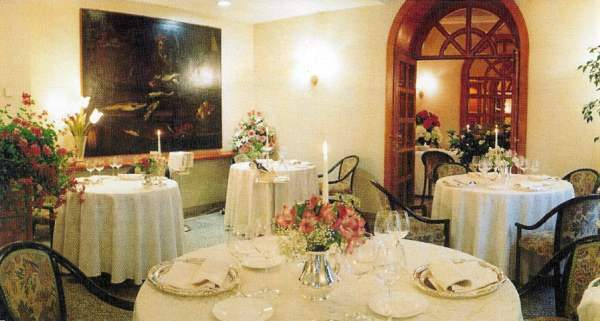 Family restaurants do not come any grander than the Ristorante da Vittorio in Bergamo. This wonderful town (half mediaeval – up the hill – and half spacious 19th Century – down below) is one of the architectural glories of Lombardy. 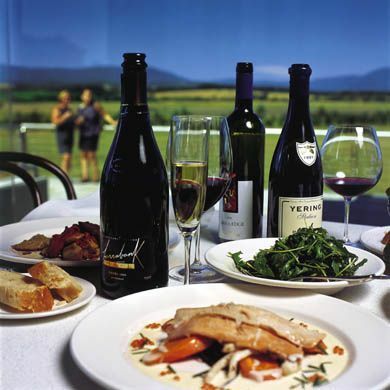 So it seems only right that it should also boast one of the region’s most impressive gastronomic destinations. Occupying a corner site on the town’s main avenue, named (for this is Italy) after Pope John XXIII, the restaurant from the outside looks quite ordinary. Only the presence of a doorman and the nature of the cars trying to park nearby (Ferrari to the right, Ferrari to the left, volleyed and thundered), gave me a clue that I had reached somewhere special. Inside, I found an attractive confection of light wood, marble floors, classical urns and a silver elephant. As I made myself comfortable at a round table with a cream damask tablecloth, I observed my fellow diners: affluent, well-dressed and young. Indeed, I decided – as a little girl tottered past me, clutching her teddy bear – that the folk of Bergamo must begin their culinary education at a remarkably low age. I salute them. They clearly know that good food and wine promote happiness and contentment. And I sensed lots of both all around, for this is a place in which an easy formality prevails. Waiters are in black tie and waitresses wear white blouses. Each table bears a silver candlestick with a single tapered candle. Glassware is high quality Spiegelau. Napkins are replaced if you leave the table. All is correct and all is friendly. So what of the food and what of the wine? Please do not neglect the wine list. It is a treasure-trove – not only of great names, but also of interesting vintages. Who would not be tempted by Italians like these – Gaja’s 1969 Barbaresco (850 euros), 1981 Tignanello (300 euros) and 1985 Sassicaia (1,200 euros)? Then there are the finest offerings from France, Australia, Spain and California: 1985 Mouton Rothschild (620 euros), 1997 Penfolds Grange (520 euros), 1987 Vega Sicilia Unico (420 euros) and 1983 Opus One (450 euros). And my eagle eye spotted three real bargains: the 2000 Cloudy Bay chardonnay from New Zealand at 40 euros, the 2000 Planeta merlot from Sicily at 40 euros and – for those of you with deeper pockets and a craving for the finest red burgundy – the 1996 DRC Echezeaux at 310 euros. Of my own bottles, I would commend to you a Lombardian chardonnay, Ca’ del Bosco, Terre di Franciacorta, 2001 (100 euros) – crisp, elegant and beautifully structured. 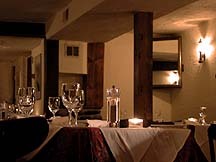 With this wonderful restaurant, Bergamo is an attractive place for gourmets. But where to stay? It must be said that accommodation is a bit of a problem. There are no really grand hotels. 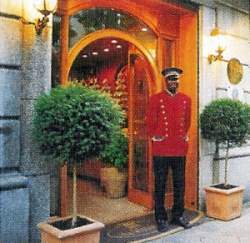 I went for a modest hostelry (the San Lorenzo) in the ancient upper city – superbly located and commendably clean, but its rooms were tiny and its breakfast was not good. But Vittorio Cerea is about to ride to the rescue. Soon – you will need to ask precisely when – he will open a restaurant with rooms (called Cantalupa) just outside town. He assured me that the accommodation will match the quality of the food, so it should be very good indeed. Meanwhile, let us flock to the present establishment – to experience and enjoy a real family restaurant. Viale Papa Giovanni XXIII 21, Bergamo 24121, Italy.